Generally we don’t think of trees when we think of desert. By definition deserts are dry, with the potential to lose much more moisture than they receive, and trees, given their size, need lots of water. But trees have their strategies. 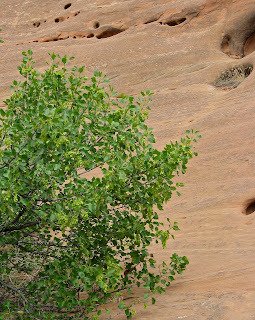 Hiking the plateaus and canyons south of Grand Junction, Colorado, I found plenty of trees. Some are adapted to the desert environment; others simply avoid it. Utah juniper on Entrada sandstone, western Colorado. The Utah juniper does quite well and is common in the high desert. It deals with arid conditions by way of adaptations that minimize evaporation, for example tough tiny leaves (scales) with a waxy coating. Junipers are evergreen and able to photosynthesize year-round, taking advantage of favorable conditions as they arise. 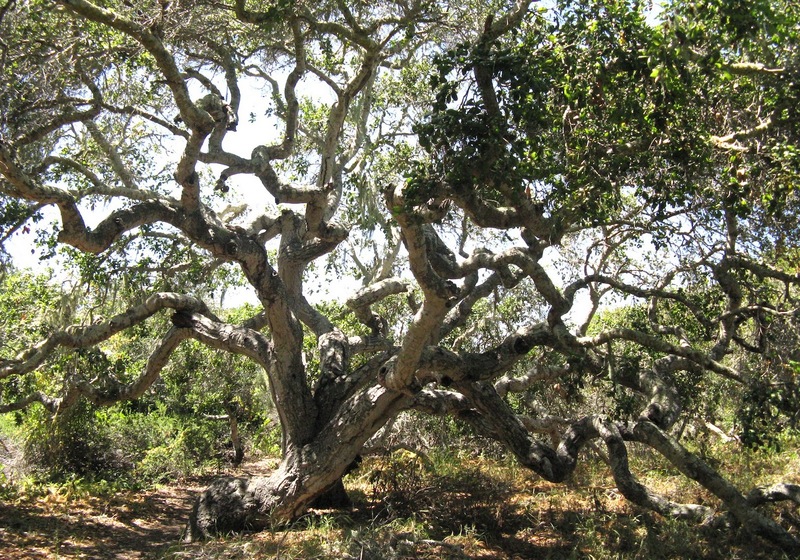 And they grow slowly -- stunted gnarled trees may be among the oldest. Utah juniper, Juniperus osteosperma, ranges from central Wyoming southwest to easternmost California. 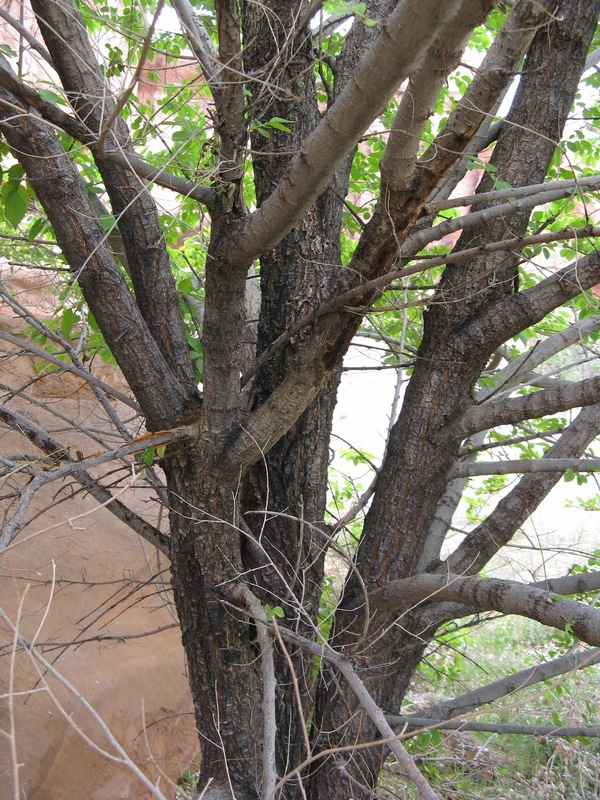 It is very common in Utah, Nevada and Arizona, often forming extensive stands with pinyon pine. Here the pinyon is all but absent; I saw only one on my hike. Rocky Mountain juniper (J. scopulorum) also grows in western Colorado, generally at higher elevations, but the two overlap in distribution. 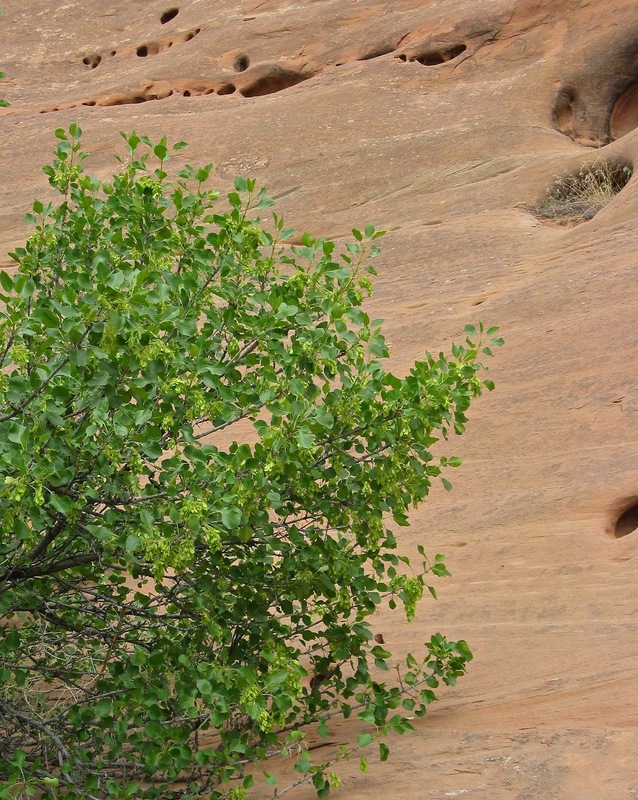 The yellowish-green color as well as lower elevation indicate that these are Utah junipers. Right: Utah juniper happy in its sandstone alcove where water runs off the rock. 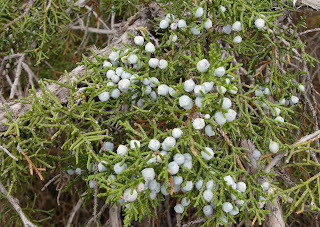 Note its luxurious growth (for a juniper) and abundant berries. 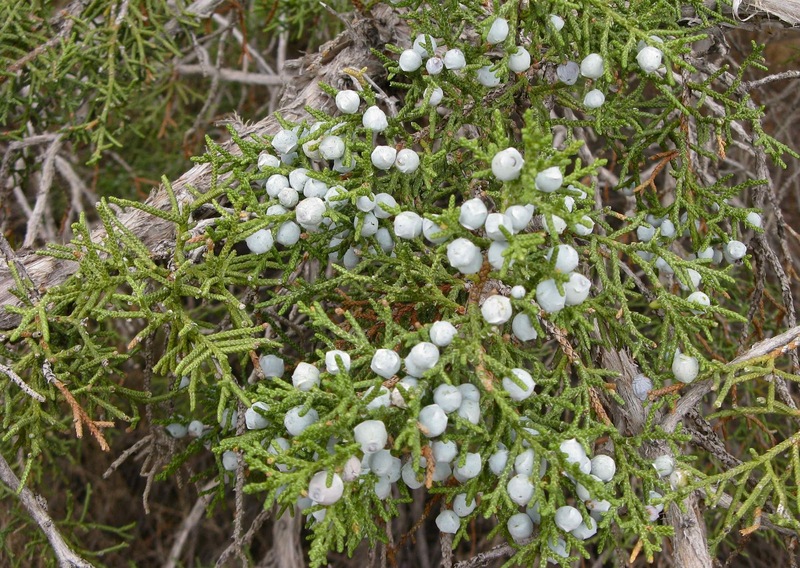 Juniper berries (photo below) are eaten by birds and small mammals, and serve as flavoring for gin. Junipers are commonly called “cedars”, though they are not true cedars (the genus Cedrus). Cedar Breaks National Monument in southwest Utah is named for the Utah junipers that grow in the breaks. where more water is available. Desert washes look dry much of the year, but often there is water fairly close to the surface, within root-reach. Tree cover often is greater in washes. The tree above caught me by surprise when I first saw it in a desert wash years ago. I was puzzling over some large shrubs and small trees with simple oval leaves when I came across one in fruit. It had the distinctive one-winged fruits of ash trees! But could this be an ash? with only simple leaves instead of the compound ones typical of the genus?? and growing in the desert??? Yes! ... evolution has reduced the compound leaf to a single leaflet, hence the name. The scientific name suggests that botanist who first described this tree was surprised as well: Fraxinis anomala. 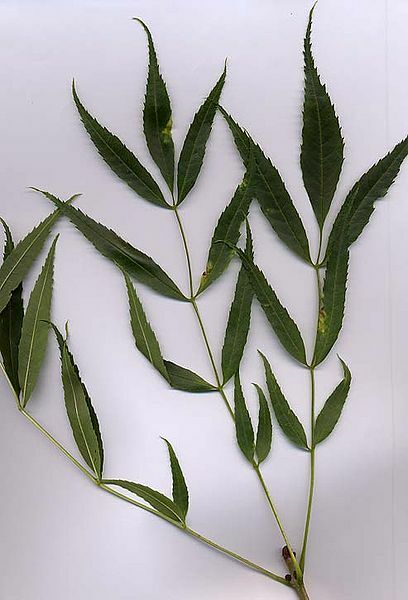 Left: "typical" ash branch with 3 compound leaves with 7 leaflets each. Photo by MPF, via Wikimedia Commons. 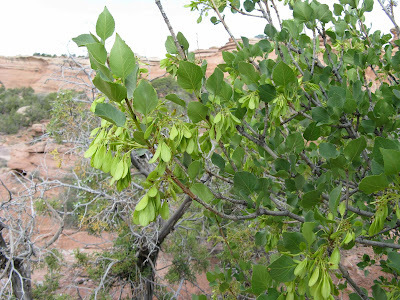 Single-leaf ash, Fraxinis anomala, is a tree of the high-deserts of western North America. It grows from westernmost Colorado, where this photo was taken, west to easternmost California and south into northern Arizona and the northwest corner of New Mexico. It is also called dwarf ash. 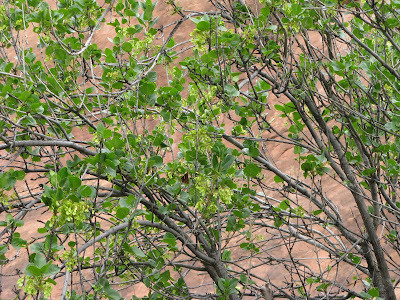 Single-leaf ash, with single-winged fruits characteristic of ash trees. The Fremont cottonwood above indicates water is nearby. 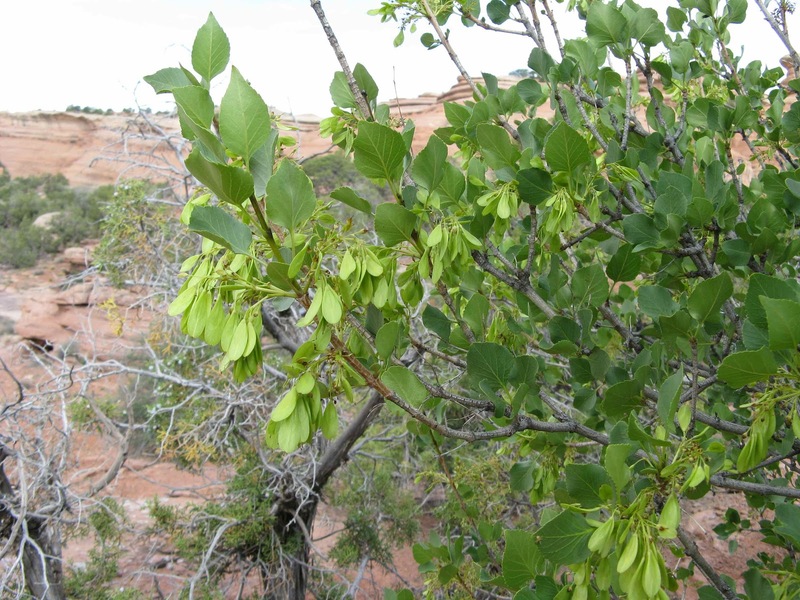 These desert cottonwoods only grow where there is water very close to the surface and soils are wet. A concrete water tank nearby confirmed my suspicions. 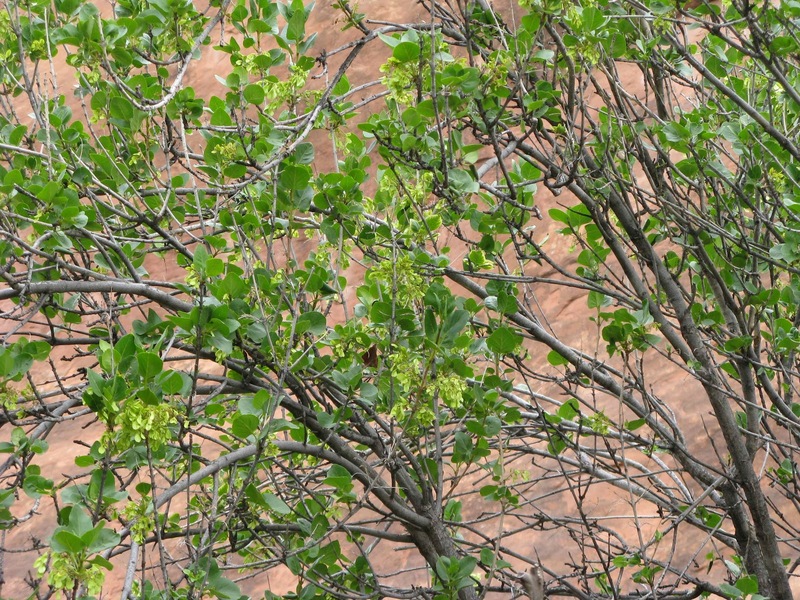 Fremont cottonwood, Populus fremontii, is common in the Southwest and throughout California. It is easy to propagate, and has been widely planted. These trees grow fast but are short-lived. 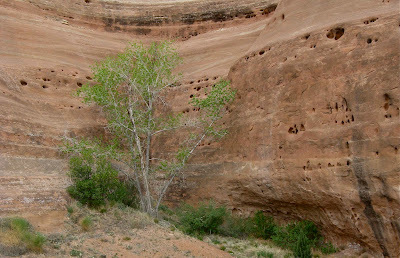 Looking across a grassy slope (above), I saw an unfamiliar bright green tree against the pale red sandstone. A closer look didn’t solve the mystery. 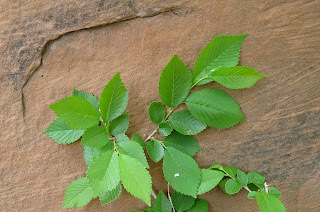 The leaves had asymmetrical bases typical of elms, but elms are water-loving trees that grow further east, aside from American elms that have been planted. Indeed, my Field Guide to North American Trees, western region (Audubon Society) lists no elms native to the region. I found my tree by flipping through the leaf photos in the “toothed simple leaves section”. 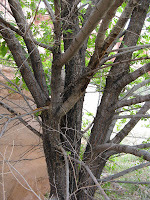 This is a Siberian elm, native to Asia from Turkestan to eastern Siberia and northern China. 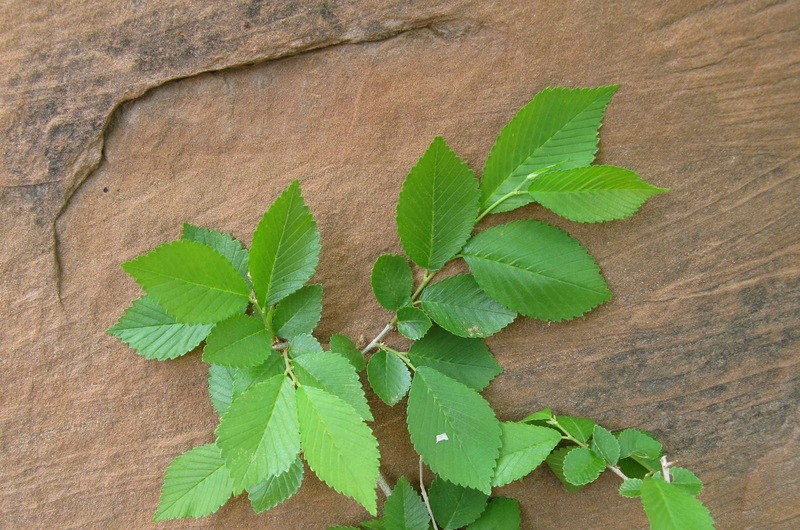 Since introduction to the United States, Siberian or Asian elm (Ulmus pumila) has become widely-naturalized (escaped and established) from Minnesota south to Kansas and west to Utah. It doesn’t need as much water as its relatives, but even so, it avoids true desert habitat. Here it probably is tapping into subsurface water that accumulates along the buried sandstone. First climb the slope of Fox Tor to the tomb of poor Childe the Hunter, who died on that very spot in a Dartmoor blizzard. From there, do keep close track of your way through the tors, for Vixana waits to conjure up her mists to confuse you. If you aren’t quick to flee, you will find yourself in her boggy lair, and when all is done you will be turned to stone, like Bowerman the hunter who looks out over Dartmoor to this day. His loyal stone hounds stand watch nearby. Left: Bowerman's Nose, Dartmoor. Courtesy Don Coldwell via Wikimedia Commons. 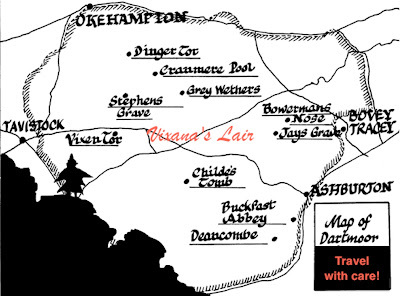 Below, Bowerman's hounds nearby at the Hound Tor. Courtesy PhillipC by way of Wikimedia Commons. I am fascinated by tors ... by their fantasical shapes and mysterious origins. 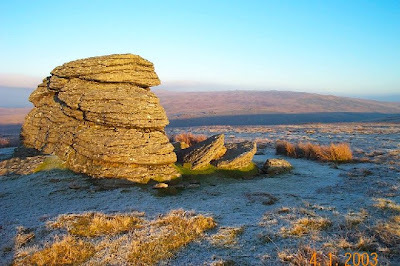 I spent a lot of time reading and thinking about tors last winter, when I had it in mind to write a post about these “creatures of stone”. That post had turned into three by the time I was done. 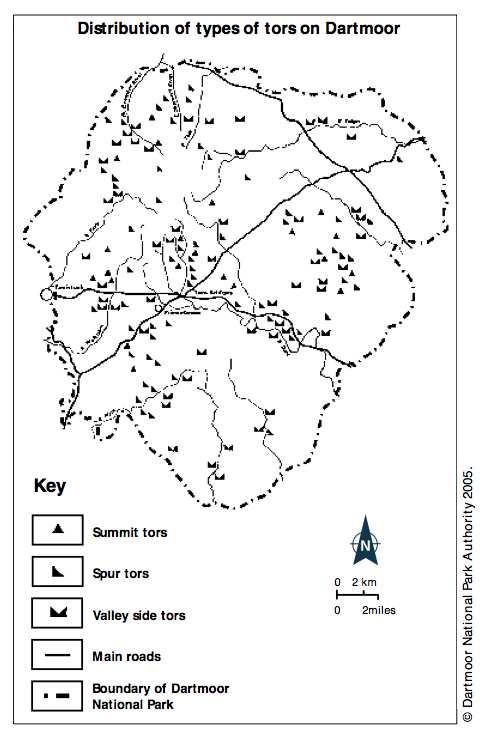 The story of tors is neither simple nor clear, and I find them even more intriguing now. My neighbors, the tors at Blair in southeast Wyoming. When Denise Tang at life as a geologist announced the topic for Accretionary Wedge #45 would be Geological Pilgrimage, Dartmoor in the South West of England was the first destination that came to mind. I considered others, but Dartmoor kept popping into my head. 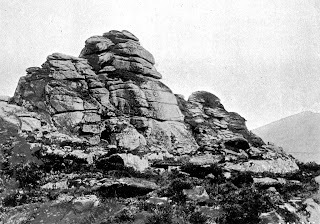 It was there that some of the earliest studies of tors were done, and Dartmoor remains an active area of research in geomorphology. 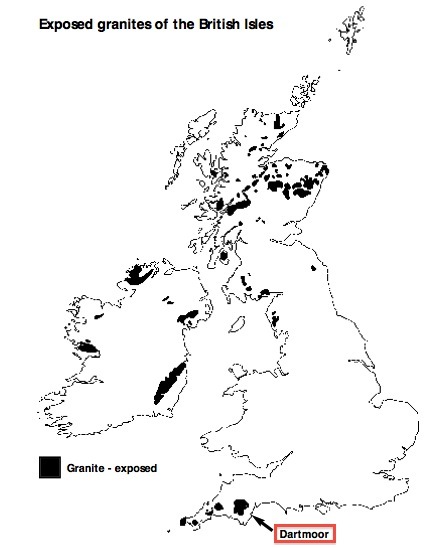 Dartmoor is underlain almost entirely by granite -- the largest area of exposed granite in southern Britain. Dartmoor granite was intruded into sedimentary rocks and lavas during late Carboniferous (Pennsylvanian) - early Permian time, ca 280 Ma. It is one of several exposed domes making up a single large batholith. 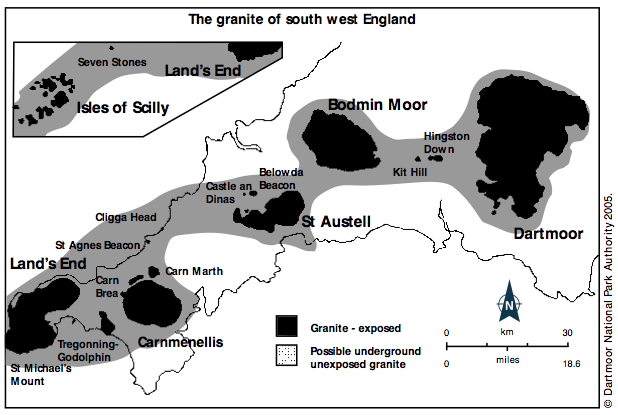 Maps right and below from Geology and Landforms Fact Sheet from the Dartmoor National Park Authority. 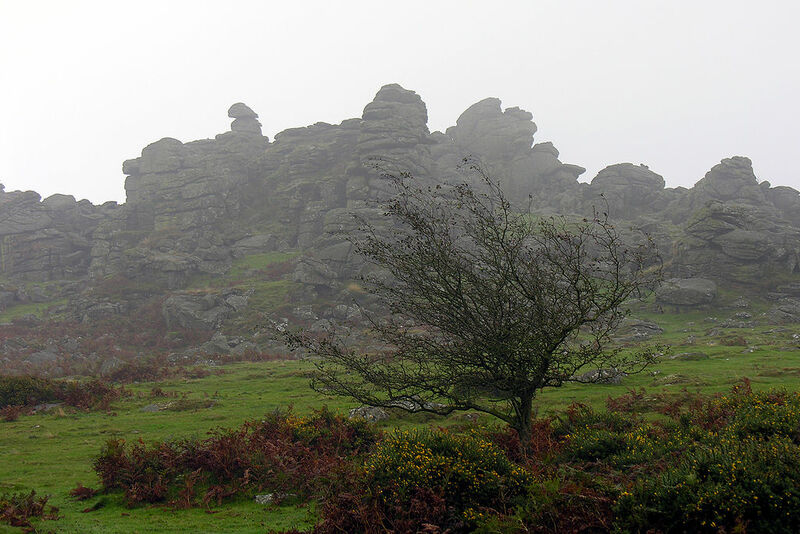 Three major types of Dartmoor granite have been recognized, including one associated specifically with tors -- the tor granite, which contains large megacrysts. Like many tors throughout the world, Dartmoor tors are thought to have developed via a two-stage process: underground weathering followed erosion of the overlying and surrounding megolith (diagram below, click to view). However, the contribution of underground weathering vs. post-exposure above-ground mechanisms such as freeze-thaw continues to be hotly debated. 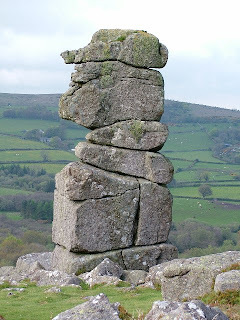 Below: a Dartmoor tor with clitter (fallen blocks) on slopes below. 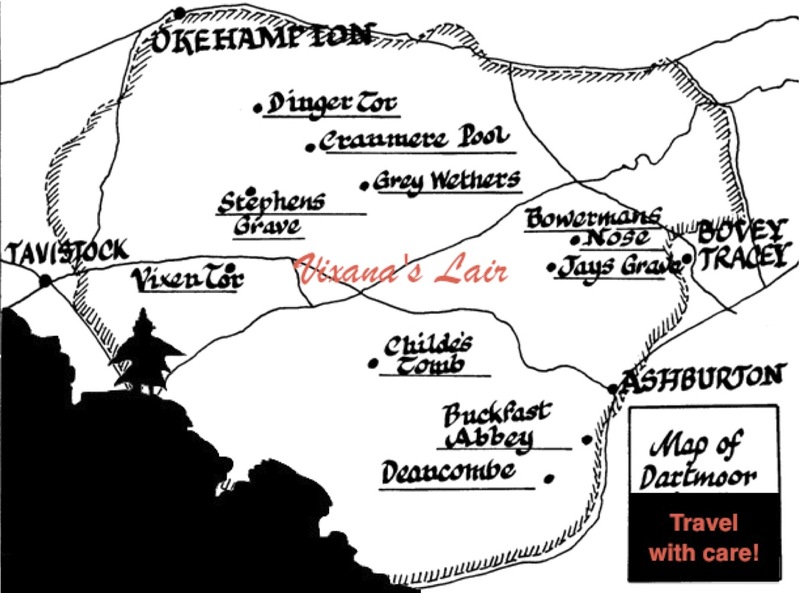 From "A Book of Dartmoor" by Sabine Baring-Gould, 1900 (public domain). 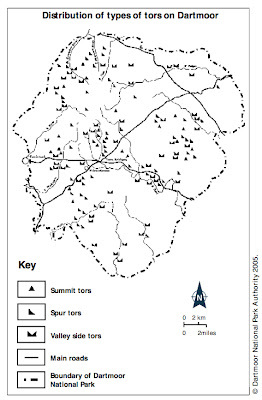 Much of Dartmore has protected status as part of Dartmore National Park, covering 954 sq km (368 sq mi). The National Park Authority has put together a Geology and Landforms Factsheet (2005), a good overview of the geology of the area. And beware the Devil, he too haunts the tors! Once when my master and I were returning home we came upon a stranger who generously offered us bread and cheese. But just as my master was about to break the bread, I saw a cloven hoof peeking beneath the long coat of the stranger. I knocked the food from my master’s hands and it immediately turned to stone. We quickly overcame our shock, and ran for home. 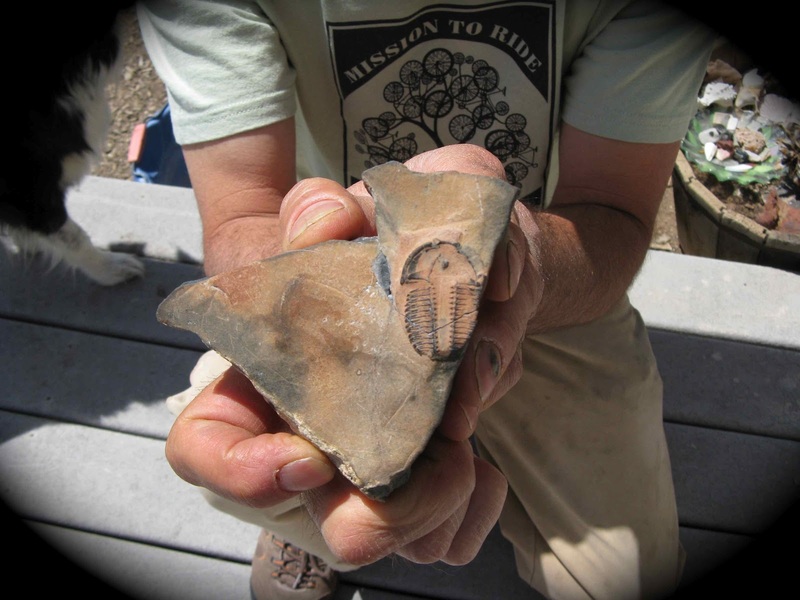 By guest blogger Danny Rosen, geologist and poet, for Accretionary Wedge #45, Geological Pilgrimage. Photos by Hollis. I wanted a trilobite. I wanted to find one myself. I was prepared to go a long distance. My buddy Bert, a fellow federal garbageman, told me of a friend whose brother had a rock shop in Delta. I drove to Delta. Lyle probed to find out if I was a seller in disguise. Nope, I just wanted to find my own trilobite, and I knew Bert. Lyle drew a map. I filled my water jug and drove out of town on Highway 6, turned onto gravel west of Hinckley, headed over Marjum Pass toward the Wheeler Amphitheatre in the heart of the House Range. I spent a couple days walking the sharp ridges, turning over detritus, finding many fragments, sleeping under Cambrian skies. The only other people around were a couple of Lyle’s men, working a quarry. 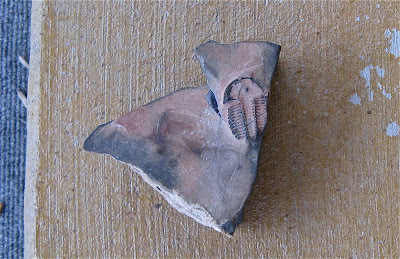 At last, I found Trilobite Jesus, Elrathia kingi, one-eyed and quiet, segmented and frozen, beautifully imperfect. I asked the man what it was worth. He eyed the jagged hard shale and said, “Well, if a Texan wanted to give fifty bucks for it, I’d take it.” We’ve been together ever since, almost thirty years, Trilobite Jesus and me. of every belief. Trilobite Jesus. this moment on the cross. Trip Plans: the amazing Expanding Great Basin! Western United States, then and now. It’s absolutely true. 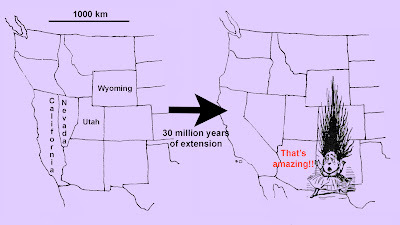 The Great Basin of western North America is expanding at a rate of one centimeter per year and if I were traveling to the West Coast 30 million years ago instead of today, the trip would be 250 miles shorter! 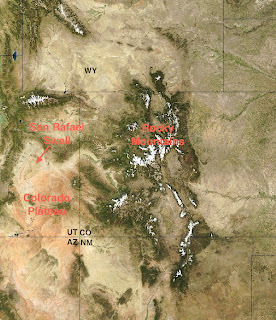 Below: Great Basin on left; from Kmusser via Wikimedia Commons. Basin and Range Physiographic Province on right, by Kathleen Smith via Wikipedia. The Basin and Range Province, and therefore much of the Great Basin, has been undergoing east-west extension since late Eocene time. 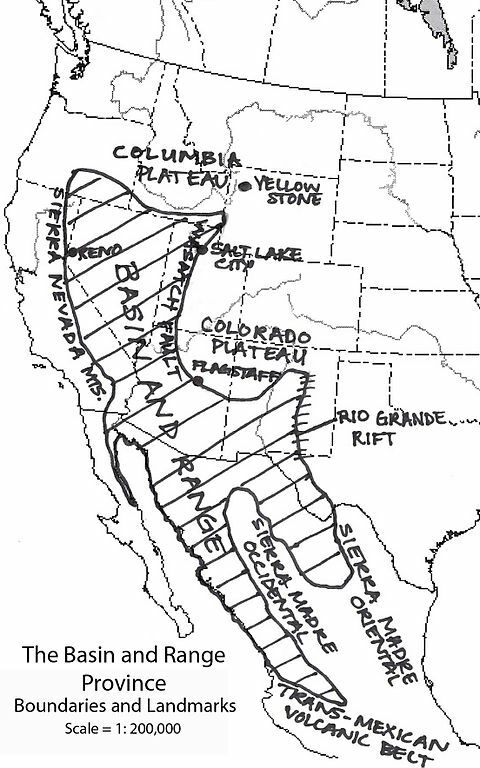 How curious ... it was just a few million years earlier (40 Ma) that western North America still was being compressed, as the shallowly-subducting Farallon plate scraped and bumped its way eastward under the North America plate, pushing up the Rocky Mountains and Colorado Plateau. But something happened to reverse the trend, and western North America began to stretch. Do we know why deformation changed so radically? There are some ideas. Perhaps the subduction angle of the Farallon plate steepened. That would also explain the concurrent flare-up of igneous activity in the Great Basin, which had been quiet during Mesozoic compression when the Farallon plate did not descend deep enough to generate magma. With cessation of compression, perhaps the continental plate “relaxed” and bounced back a bit. But much more is needed to explain the large amount of extension across the Basin and Range Province during the last 30 million years. Perhaps the major tectonic event to the west was to blame. At 20 Ma, roughly the same time that extension increased significantly, the convergent plate boundary along the west coast of North America began to change to a transform boundary, as the Pacific Plate encountered the North American plate while the Farallon Plate was consumed under the continent. Shear along the growing transform boundary may have provided enough stress and strain to stretch (pull apart) the Great Basin, continuing into the present. “These four diagrams illustrate the shrinking of the formerly very large Farallon Plate, as it was progressively consumed beneath the North American and Caribbean Plates, leaving only the present-day Juan de Fuca, Rivera, and Cocos Plates as small remnants. Large solid arrows show the present-day sense of relative movement between the Pacific and North American Plates. (Modified from USGS Professional Paper 1515).” From This Dynamic Earth by the US Geological Survey. 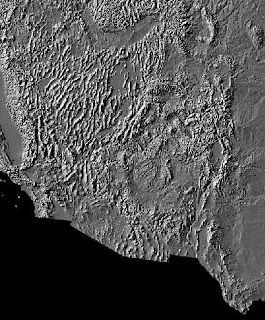 Note the elongating transform fault, now infamously represented by the San Andreas fault in California. 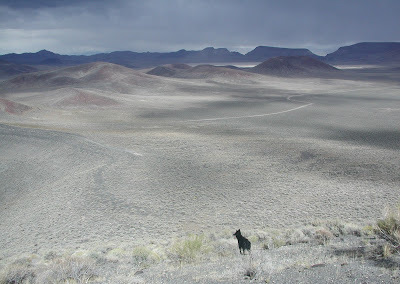 American geologist Clarence Dutton famously described the topography of the Great Basin as “an army of caterpillars marching south into Mexico” (or north from it, both versions exist). He was referring to the regular pattern of generally north-trending uplifts. (Update: see this entertaining post, leading up to the actual quote and source). 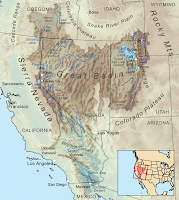 of the United States: Basin and Range Province (USGS). Dutton’s caterpillar army was one of the results of regional extension. Most of the mountain ranges (caterpillars) and intervening basins are blocks uplifted and downdropped along normal faults, and movement along normal faults is associated with extension. The Basin and Range Province is often described as classic “horst and graben” topography (German for heap and trench). 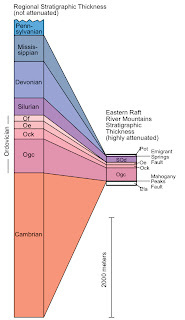 But if these ranges and basins were only simple horsts and grabens, there would not be enough lateral movement to explain the amazing extension of the Great Basin over the last 30 Ma. normal faulting associated with extension. Many of the basins are actually half-grabens. 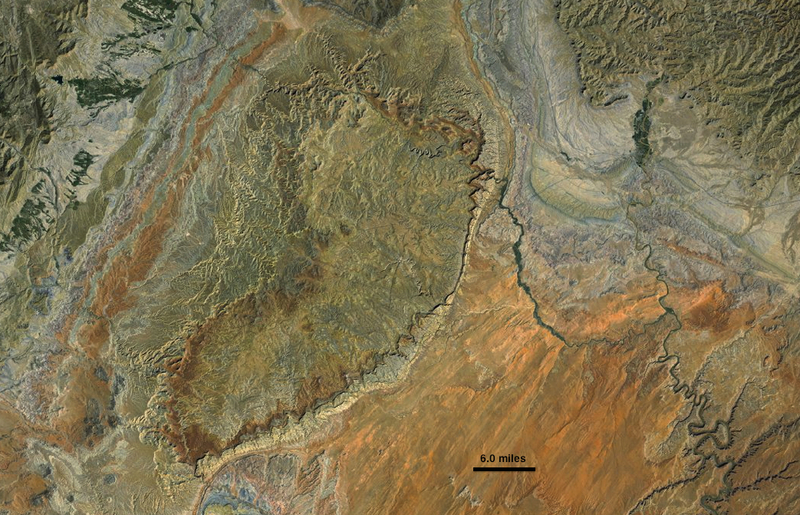 A half-graben is bounded by a listric fault -- a normal fault that starts out with the usual high angle at the surface, but flattens with depth, becoming nearly horizontal. The hanging wall (dropping block) is increasingly tilted as it moves along the curving fault, and the lateral component of motion is greater. Voilá ... more extension accounted for! 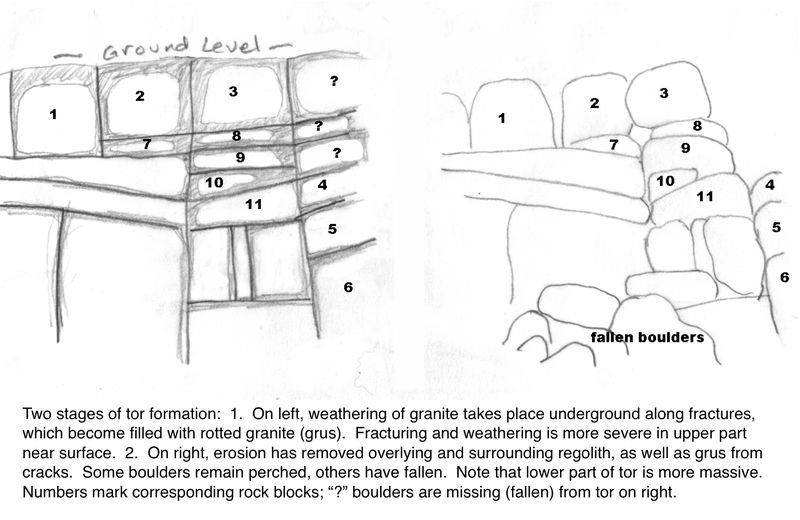 Structural Geology, online materials. Also in DeCourten 2003. The greatest amount of extension -- sometimes four to five times that found elsewhere -- has been documented in areas of metamorphic core complexes. MCCs are domes of high-grade metamorphic rock that have “shed” the strata above to various degrees. The overlying strata, broken into blocks, slide along low-angle detachment faults. 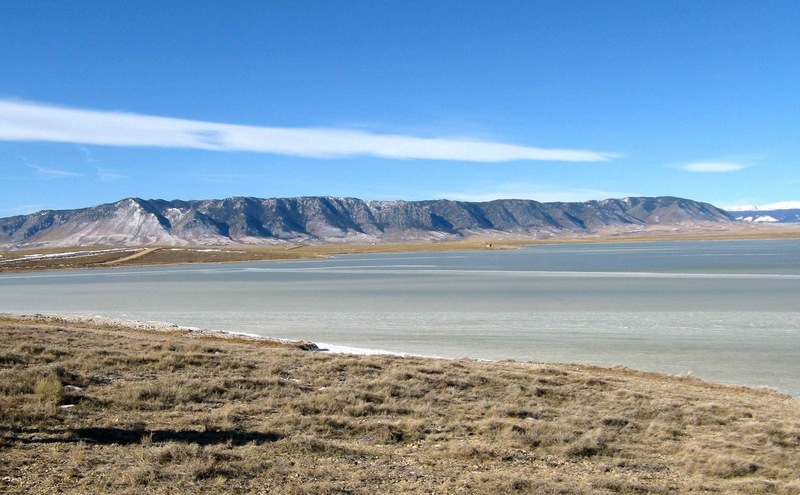 MCCs occur where local extension is sufficient to result in the rise of magma and hot rock; doming can represent as much as several miles of uplift. Qualifier: Origins and dynamics of MCCs remain controversial; I include here only simplified versions of some of the theories. 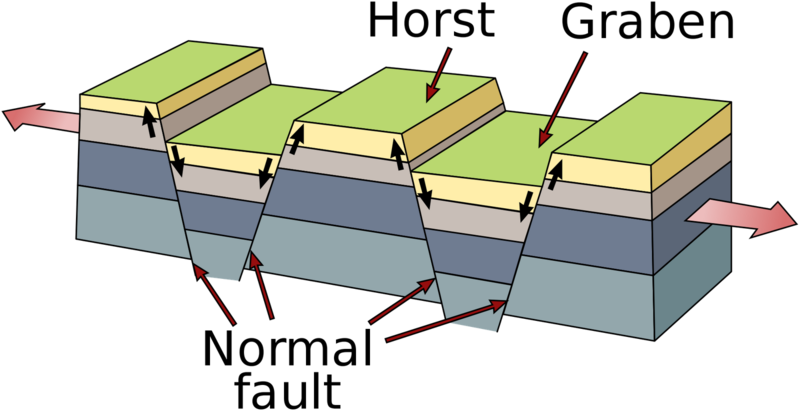 Metamorphic core complex; from Basin and Range (source not given). Above: Northern Snake Range décollement or detachment fault, part of a metamorphic core complex; courtesy Looking for Detachment. 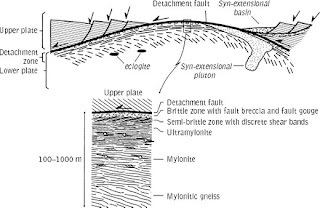 LFD currently has 21 posts tagged "detachment", most recently Top 10 reasons I love detachment faults / core complexes. "Geologists dispute the formation and development of these things, allowing for great arguments over beers, great field trips and arm-waving sessions, and exceptional reason for practising down-to-earth to wild-eyed geo-speculation." 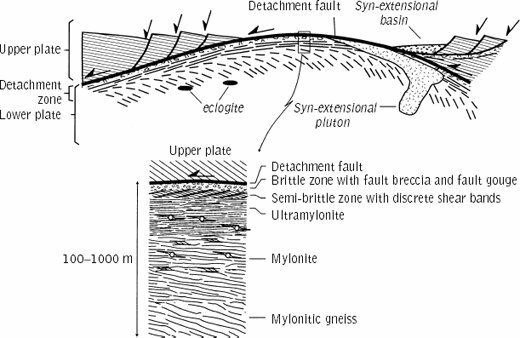 The large amount of extension associated with MCCs can cause severe thinning of overlying strata. Right: highly-attenuated capping strata, East Raft River Mountains, Utah. 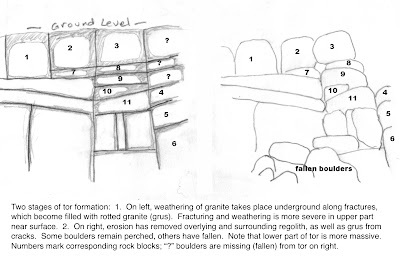 From Utah Geological Survey Survey Notes, January 2012. 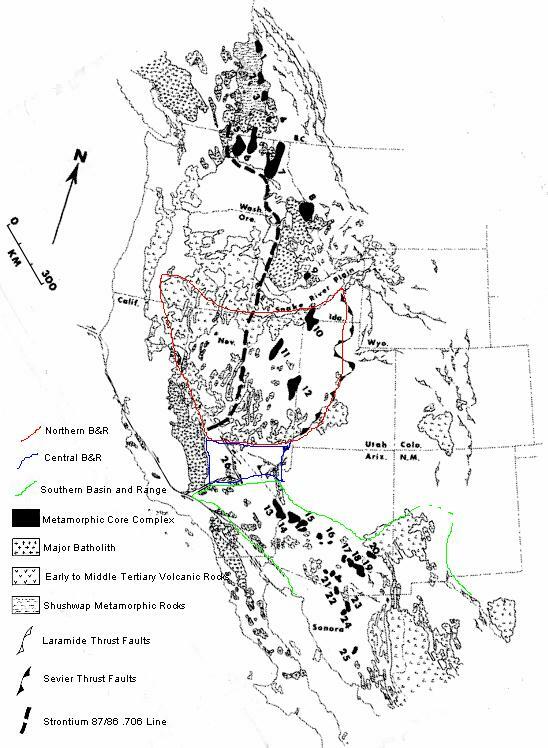 Below: black blobs are metamorphic core complexes of western North America (click to view). From Metamorphic Core Complexes complied by V. L. Rystrom; no source given. At this website Rystrom presents six theories of core complex development. 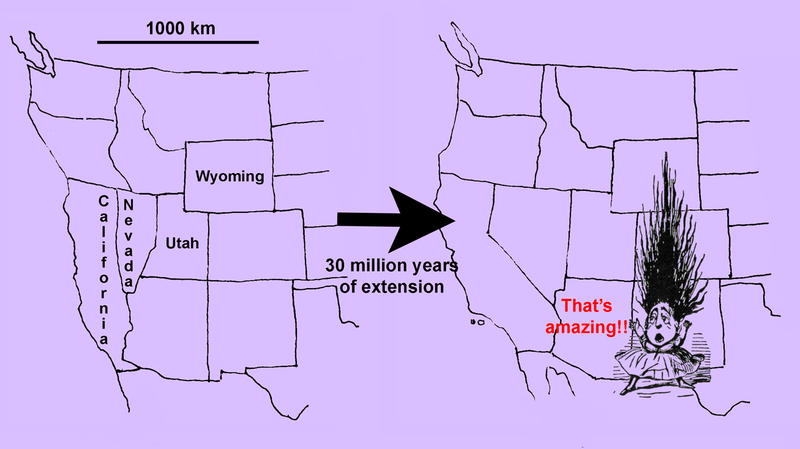 Obviously this has been an absurdly brief overview of the geologic story of the amazing Expanding Great Basin. I’ve omitted the widespread igneous conflagrations entirely, as well as the possible role of shallow ductile rock layers. But I have other obligations -- my trusty steed is saddled and waiting, and the trail west calls. DeCourten, Frank. 2003. 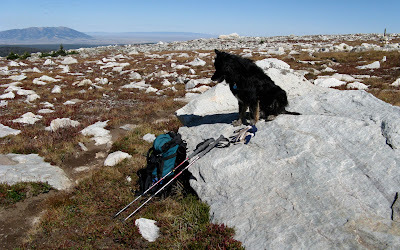 The broken land: adventures in Great Basin geology. Salt Lake City, Utah: University of Utah Press. Much for the information in this post comes from DeCourten's enjoyable book. 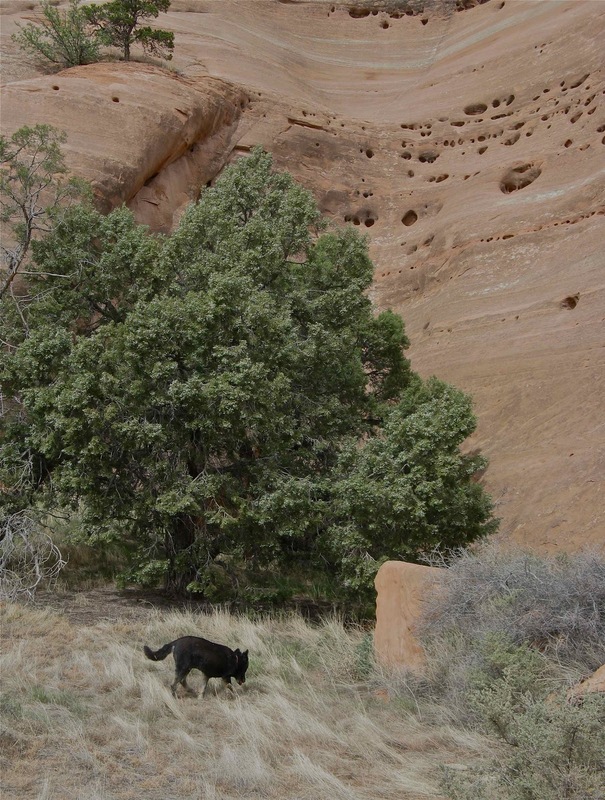 Recent Treasures: trees, trees, and more trees, including some in rocks; neat geo/adventure blog; and Earth Day history. I have only a small collection of blog gems to share today, but they are gems. 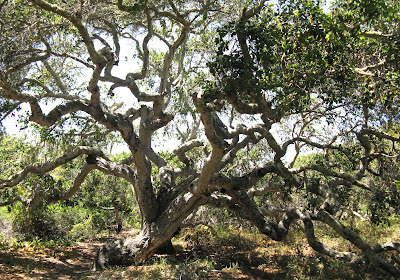 I discovered several blogs of interest at Treeblogging.com, "a forest of arboreal links”. 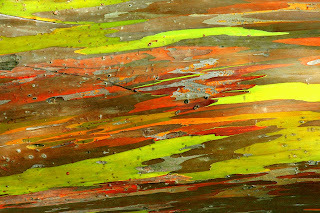 Tree A. Ware ... mad about trees posted some truly spectacular photos of amazing color and beauty featuring the rainbow eucalyptus. 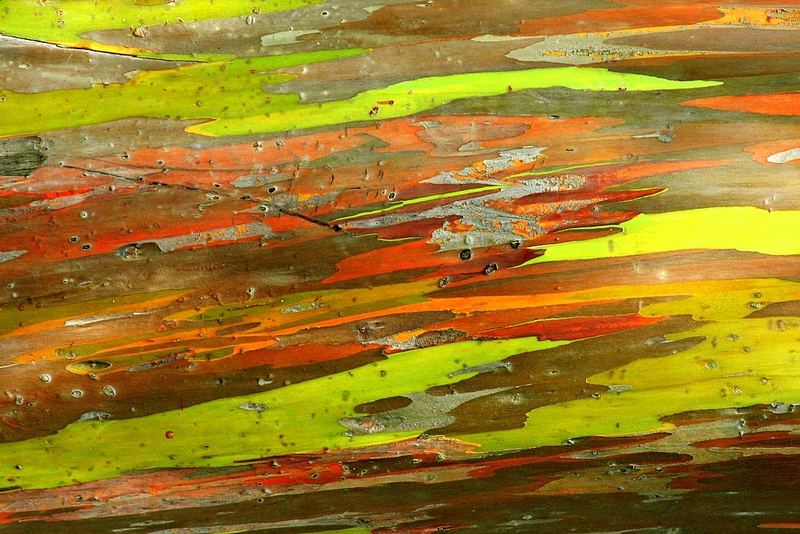 Rainbow-hued tree bark below courtesy carvalho by way of flickr. 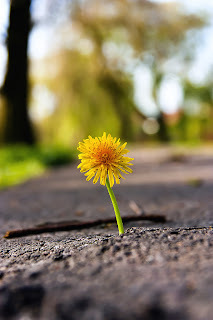 Loose and Leafy put together a wonderful post about urban gardens: the tough little plants that make it amidst concrete and metal and speed-bump cobbles in urban landscapes. Dandelion to left courtesy martijndevalk.nl by way of flickr. 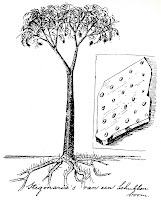 For plants in rocks, check out the cool fossil scale trees courtesy Wooster Geologists. 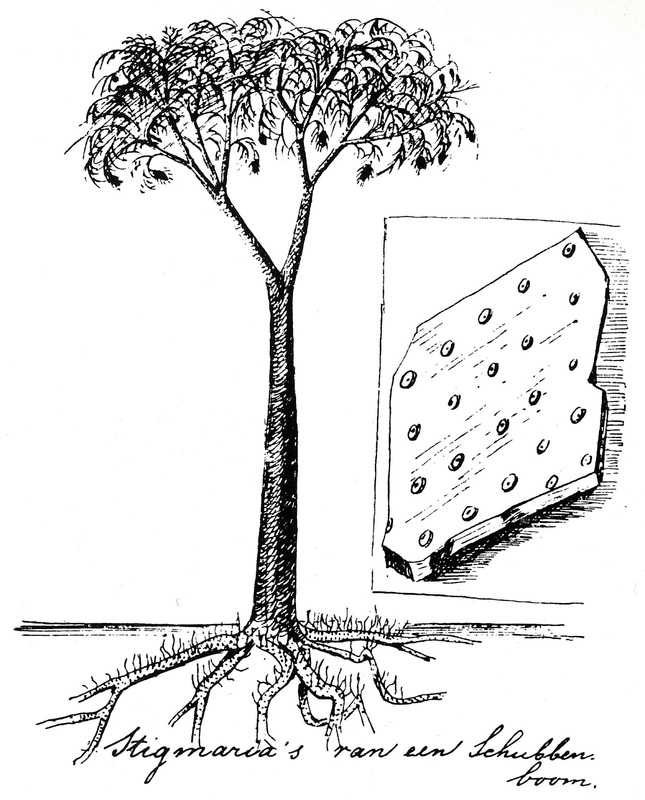 Right: reconstruction of the scale tree Lepidodendron by Dutch conservationist Eli Heimans (1911). 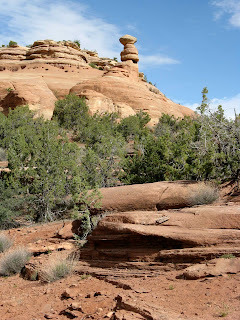 I was happy to find the geology/adventure/photo blog, Cedar & Sand, while searching for information on the San Rafael Reef -- terrific photos and nice stories, too. 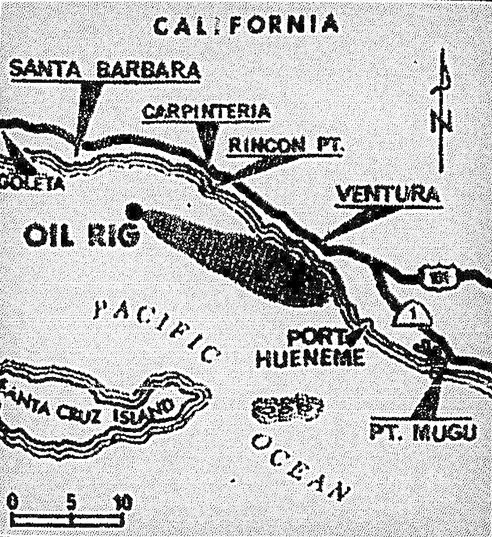 from the American Oil & Gas Historical Society. 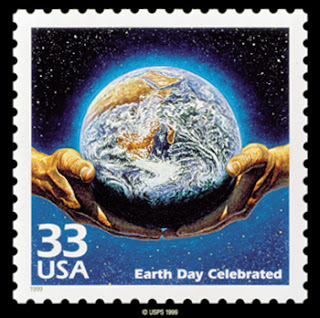 A friend and I got to reminiscing about our experiences on the first Earth Day back in 1970, prompting me to refresh my memory re its history. 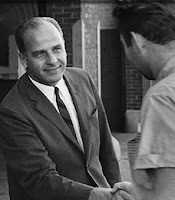 I came across this very interesting website/archive devoted to Gaylord Nelson (left), Earth Day, and “the making of the modern environmental movement”. 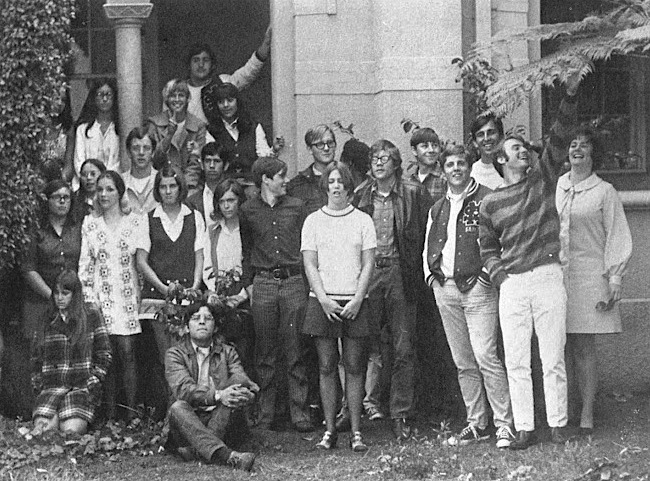 The making of the modern environmental movement: Santa Maria High School Ecology Club, 1970. By 1970 the environmental movement had reached our town. We formed an Ecology Club at our high school, and our science teacher lined up excuses for us so that we could attend the “Environmental Teach-in” in Santa Barbara on the first Earth Day. We packed into Frank’s yellow Chevy and headed south. It was an exciting day for idealistic teenagers from a small working-class town, culminating in an “occupation” of the Santa Barbara pier. It was the beginning of my trajectory as environmentalist, field botanist and conservation biologist. Now 42 years later I’m still at it, but I find it very easy to fall into cynicism and pessimism in thinking about the future of US environmentalism. What was once progress now flounders amidst bureaucracy and red tape. A Congress that once passed legislation such as the Wilderness Act, Clean Air Act and National Environmental Protection Act, now would not be caught dead doing anything that might hamper economic growth. How easy it is to stick our heads in the sand. And what happened to all those idealistic Boomers? are they only worried about their IRAs and 401ks now? But then I look around my part of North America and I forget about all the craziness for a little while. I remain impressed by the wildness in our country, and the value we put on natural areas. Maybe hope is not so silly after all. It is critical to take this step back every now and then, for the sake of sanity if nothing else. 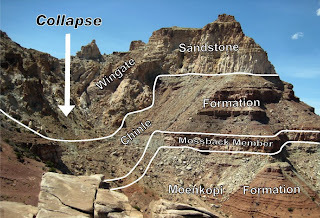 Photo from Moabdave via Wikimedia Commons. As some readers know, I’m planning a trip from Wyoming to the West Coast, looking for interesting geo-destinations along the way. From my first stop in Unaweep Canyon on the Uncompahgre Plateau in western Colorado, I will head west to visit salt anticlines in the Paradox Basin. 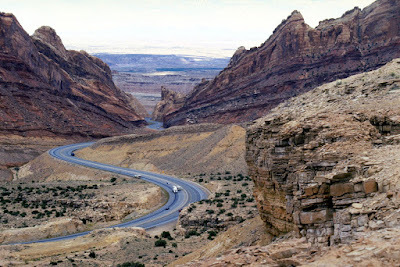 Continuing west on I-70 through Utah, the absolute-number-one-most-beautiful stretch of interstate highway in my opinion, my next destination will be the San Rafael Swell, 15 miles west of Green River, Utah and 45 miles east of Salina, Utah. 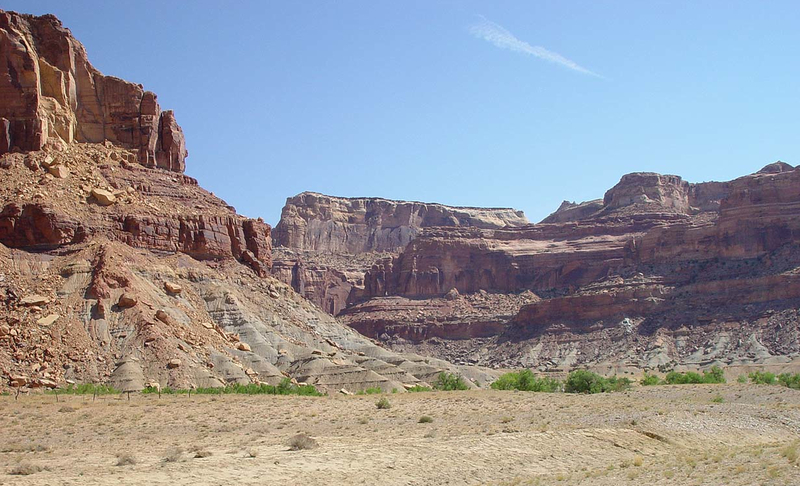 Above, the kidney-shaped structure left center is the San Rafael Swell on the Colorado Plateau. 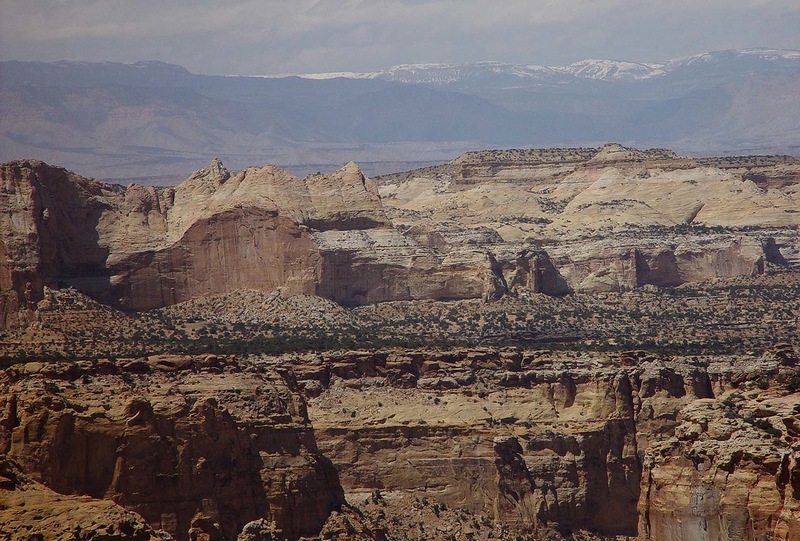 Note the steeply-tilted sandstone strata that form the San Rafael Reef along the east and southeast flanks (click to view). Courtesy ArcGIS Online. Below, the Swell in context; modified photo from NASA's Visible Earth. There are many great geo-resources for the Swell, both printed and online. I highly recommend Written in Stone’s lengthy and interesting post, Geology of the San Rafael Swell, for clear explanations of the Big Picture (critical for my understanding), fantastic small-plane aerial views of the Swell, abundant geologic illustrations, and discussions of stratigraphy and tectonic history. Rather than going into detail in this post, I refer you to WIS’s blog-tome. 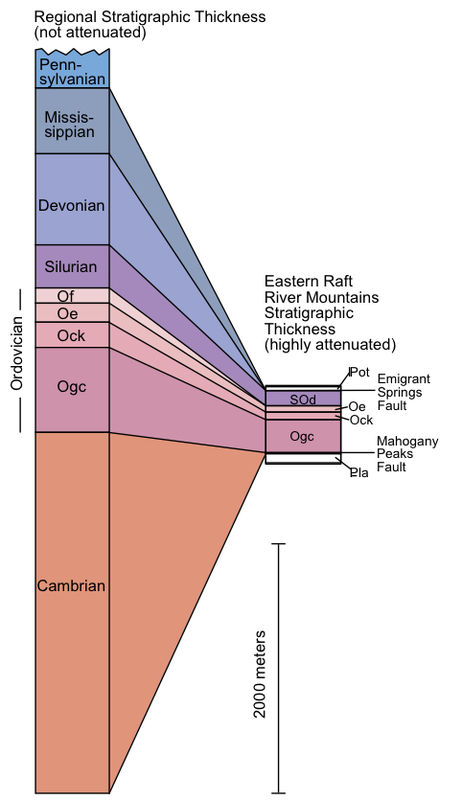 Another resource I like a lot is Robert Fillmore’s Geological Evolution of the Colorado Plateau (2011). Fillmore doesn’t hold back on the many controversies associated with the geology of this area. I look forward to careful reading and thinking about regional geologic history during spring evenings in the high desert, hopefully under starry skies. It was the Laramide Orogeny and resulting landforms, so striking and obvious and common across Wyoming, that turned me on to geology while a grad student in Botany, greatly enhancing my understanding and appreciation of landscapes and plant geography. But I guess I missed the bigger picture. All these years I had assumed that the Laramide Orogeny, a period of mountain-building 70 to 40 Ma (million years ago), was synonymous with the Rocky Mountains. So I was excited to discover that the San Rafael Swell is a Laramide uplift, one of the westernmost. However ... the style of Laramide deformation on the Colorado Plateau differs a bit from that of the Rockies to the east. The San Rafael Swell and other uplifts on the Colorado Plateau are similar to Laramide structures in the Rocky Mountains in several ways: 1) they are broad-crested uplifts, often with steep flanks with hogbacks or flat-irons of more resistant strata; 2) they are partially bounded by high-angle reverse faults involving basement rocks (often reactivated older faults); 3) they are associated with adjacent downdrops (basins). Sheep Mountain in southeast Wyoming (below, viewed from east) is typical of Laramide uplifts in the Rocky Mountains. It is bounded by a high-angle reverse fault on the east side, with Precambrian crystalline rocks now standing above the Cretaceous sedimentary strata of the adjacent downwarped basin. The break in slope near the base, highlighted by recent snow, marks the transition to Precambrian rocks above. The big difference between Laramide structures of the Rockies and those further west is seen at the surface. 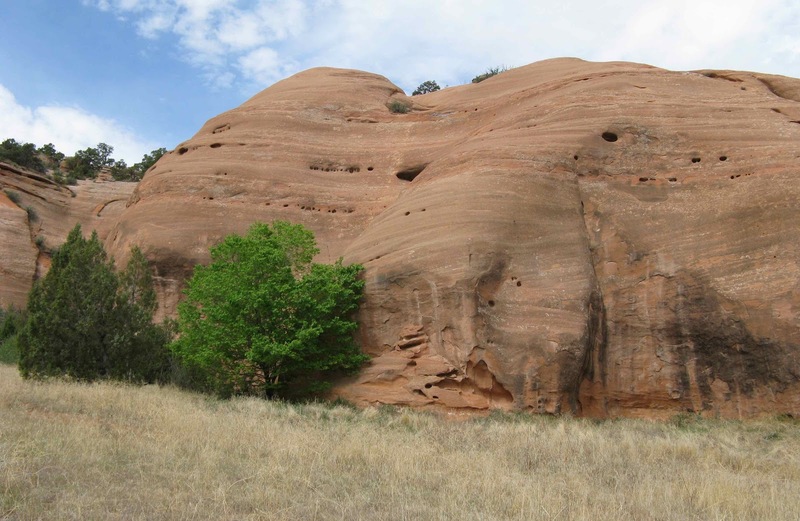 Thick sedimentary strata of the Colorado Plateau “cushioned” the effects of faulting (Fillmore 2011), and the associated reverse faults typically do not reach the surface. The surface expression is a fold rather than a fault, specifically a monocline. Spectacular examples include the San Rafael Reef on the east side of the Swell, the Waterpocket Fold of Capitol Reef National Park, and Comb Ridge between Bluff and Mexican Hat, Utah. The Grand Canyon has cut through several monoclines, and deeply enough to reveal underlying reverse faults involving basement rocks. Cross-section through San Rafael Swell. Note steep fold on east, and underlying fault in basement rocks (click to view). Courtesy Utah's Castle Country. 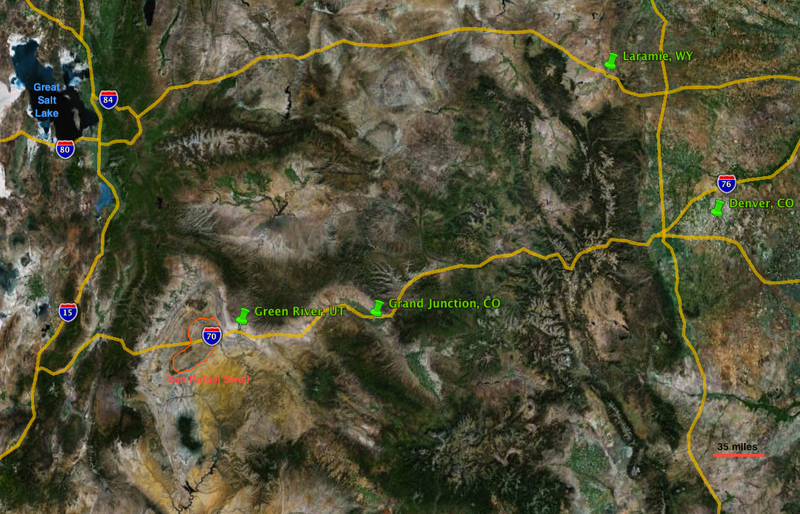 April 18 update: The story behind the monocline may not be so simple. Kim at All of My Faults are Stress-Related (pointed out by Silver Fox) explains that there are "space problems" with this model, and goes on to discuss alternatives. Darn! Interstate Highway 70 exits the Swell headed east by way of Spotted Wolf Canyon, which cuts though the steeply-dipping sandstones of the San Rafael Reef (dips of 89º in places! ); photo by Dennis Adams, National Scenic Byways Online. In my readings about the Colorado Plateau, I also discovered that geologists consider Laramide mountains weird. Blakey and Ranney (2008) call the Rockies “one of the most enigmatic mountain ranges on Earth”. 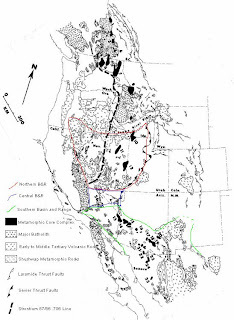 Apparently mountain ranges typically form along plate boundaries, due to collision, subduction and other kinds of plate jostling, but the Laramide uplifts of the Colorado Plateau and the Rocky Mountains are located up to 1000 miles east of the active western margin of North America. This is not easy to explain. Fillmore (2011) doesn’t shy away from this paradox. He discusses in detail the most widely-accepted explanation of the inconveniently-intracontinental Laramide Orogeny. 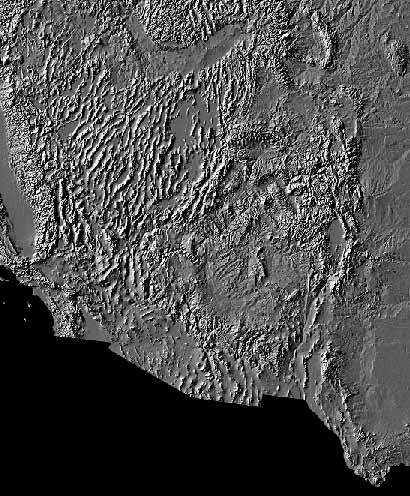 At some point there was a change in the angle of subduction of the oceanic plate moving under the west coast of North America. It became more shallow, resulting in deformation of continental crust far inland. Movement of basement-involved blocks, often along reactivated older faults, produced the broad anticlines, synclines and monoclines characteristic of the Laramide Orogeny. But not all the evidence fits neatly into this picture; Fillmore includes two competing variations of the story. Along I-70 inside the San Rafael Swell. Courtesy ErgoSum88 via Wikimedia Commons. 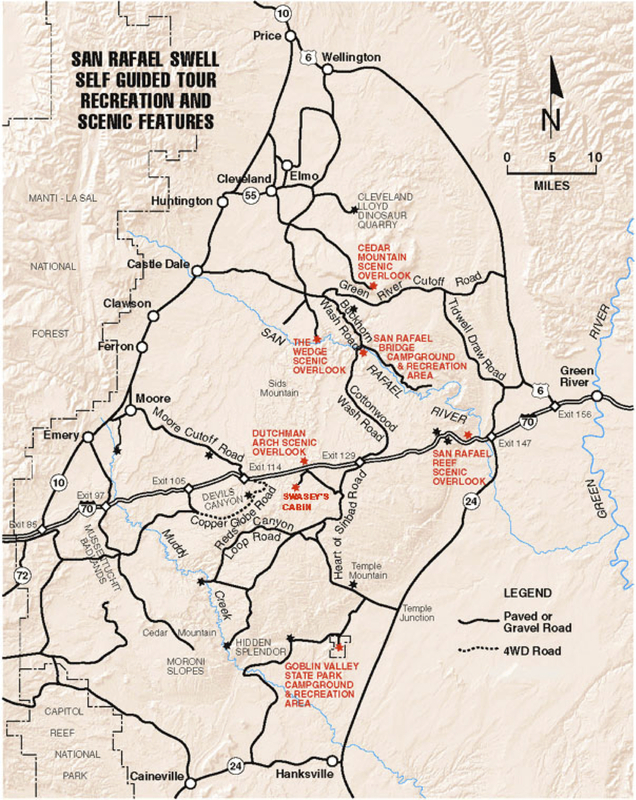 Cottonwood Wash/ Buckhorn Wash A 30-mile gravel road tours the northern part of the Swell. 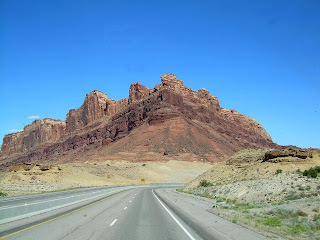 Utah’s Castle Country provides a brief road log of attractions (use link above). Cleveland Lloyd Dinosaur Quarry (see CLDQ wikipedia page) is a dinosaur graveyard in the Jurassic Morrison Formation, like our own Como Bluff in southeast Wyoming. The bones are well-preserved, but there are few intact skeletons -- just a massive jumbled collection of bones. For some reason the carnivorous Allosaurus is especially common. The site has a Visitor Center, as well as tours and hiking trails. 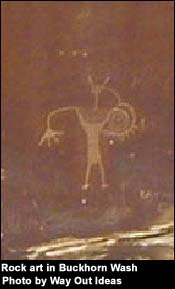 Rock Art -- pictographs and petroglyphs -- can be found throughout the Swell. The most-visited site probably is the Buckhorn Wash Panel, along the main gravel road in the Swell (photo to right). Temple Mountain is the highest point along the San Rafael Reef -- the steeply-tilted sandstone strata along the east flank of the Swell. This was a uranium mining district; the old roads are now used for hiking, horseback riding and biking. I found the cool photo below, annotated to show the stratigraphy of the east flank of Temple Mountain, at Cedar & Sand, a geology/adventure blog I was happy to discover. Go to Goblin Valley for more great photos of the San Rafael Reef area. 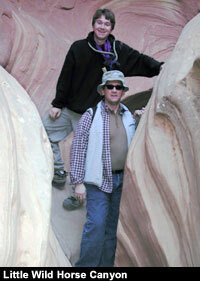 Surreal hikes in narrow canyons “Keesle Country is a maze of canyons in the southwest corner of the Swell. A short hike or horseback ride into this road-less area will provide an introduction to its primitive character.” And then there is the popular Little Wild Horse Canyon (photo to left). I get the impression that the San Rafael Swell is a place to wander with destination unknown. 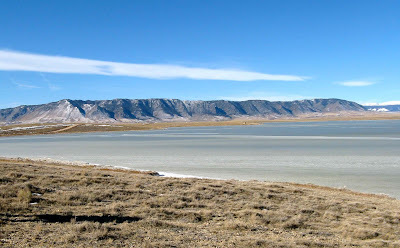 “Most of this huge area [2000 sq mi] is open to the public and adventures are left only to the visitor's imagination” (from Utah’s Castle Country). These are the kinds places I seek out, and I always wonder how long they will stay that way. I worry that the Swell might go the way of Moab to the east. Already it is being advertised as “Utah’s fastest growing tourist destination” ... sigh, better enjoy it now! 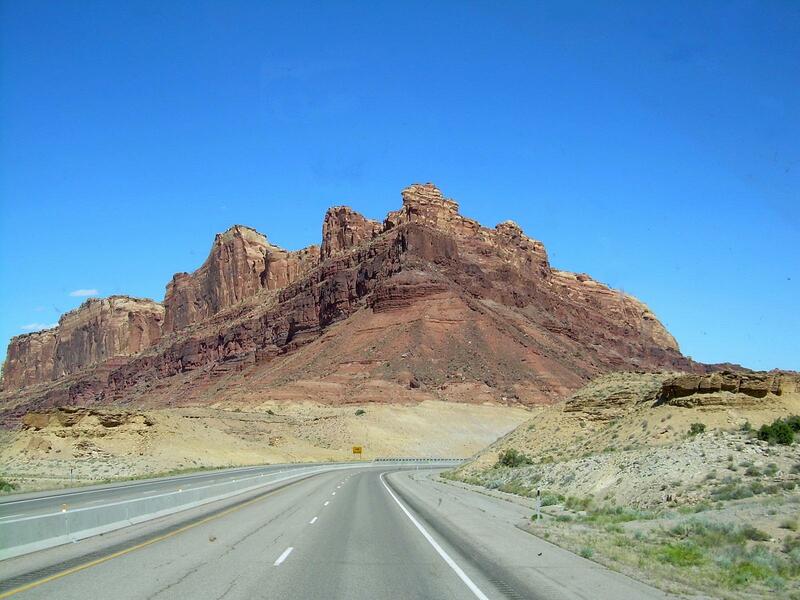 You can access the San Rafael Swell from Interstate Highway 70 west of Green River, Utah. Courtesy GoogleEarth, click to view. Other ways to get into the Swell, courtesy Utah's Castle Country. Download full-sized PDF here. 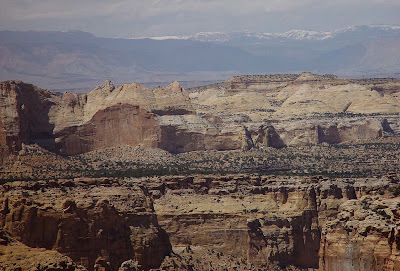 San Rafael Swell at Utah's Castle Country is a good starting point. San Rafael Swell, Solitude for the spirit ... is another useful introductory site. San Rafael Swell at summitpost.org offers useful information on hiking, canyoneering, climbing, things to see, weather ... and lots of photos. Geology of the San Rafael Swell by Written in Stone is a great resource, as I mentioned at the beginning of the post. 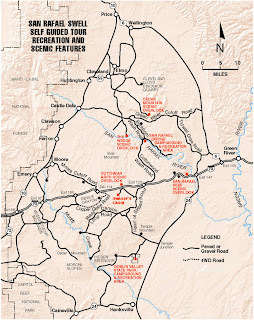 April 18 update: see also Ron Schott's San Rafael Swell GigaPan site and Looking for Detachment's San Rafael Swell post. Baars, Donald L. 2002. 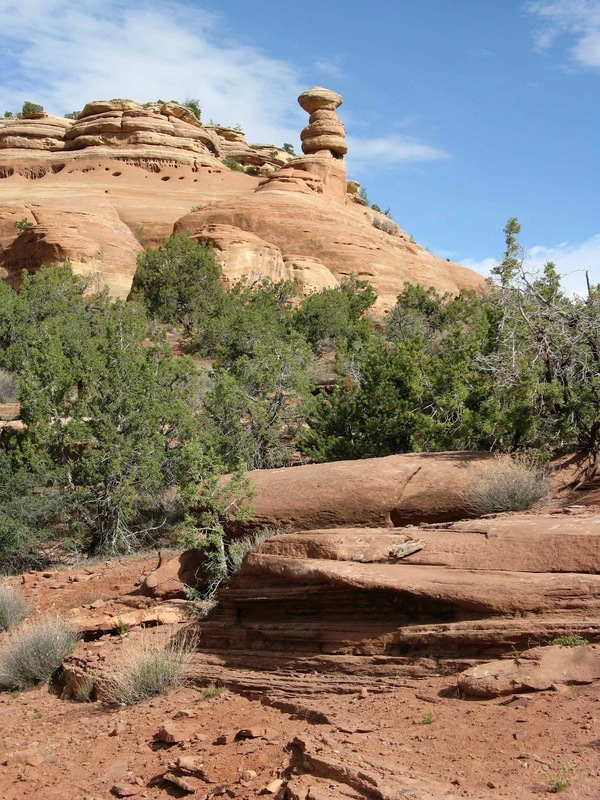 A traveler's guide to the geology of the Colorado Plateau. Salt Lake City: University of Utah Press. This is a series of road logs with brief introductions to each section. The logs are quite detailed, especially regarding stratigraphy, with frequent mileages. I'm hoping it will make me more confident in identifying formations. 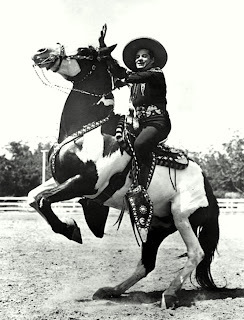 Blakey, Ronald C. and Ranney, Wayne. 2008. Ancient landscapes of the Colorado plateau. Grand Canyon, AZ: Grand Canyon Association. 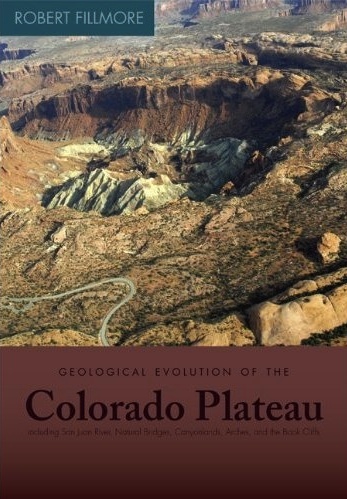 This is a pretty amazing book, with maps (reconstructions) of the Colorado Plateau region and western North America from the late Precambrian on. The text is fairly non-technical, but with thorough Big Picture explanations of the geologic history of the Plateau region. 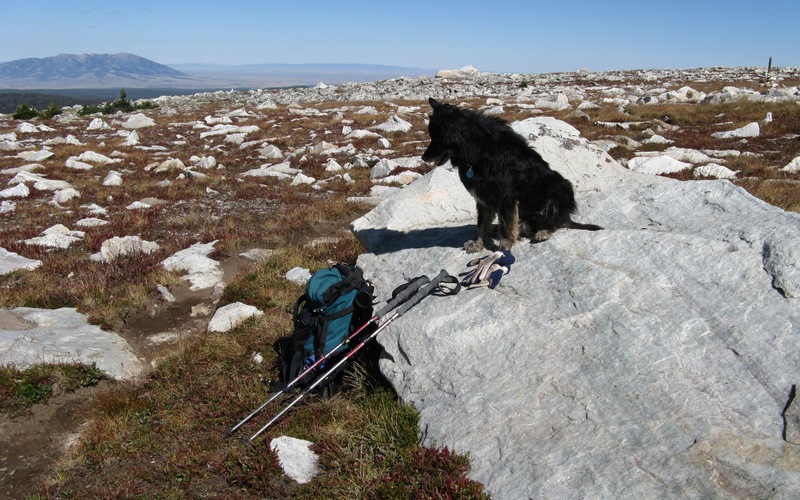 Wayne Ranney also has a geology blog with many posts about the area -- Earthly Musings. I need to get busy perusing it. Fillmore, Robert. 2010. Geological evolution of the Colorado Plateau of eastern Utah and western Colorado, including the San Juan River, Natural Bridges, Canyonlands, Arches, and the Book Cliffs. Salt Lake City: University of Utah Press. Probably I've raved enough about the depth of coverage in this book. It ends with nine tours (road logs). Wake up, sleepyheads ... it’s Spring!